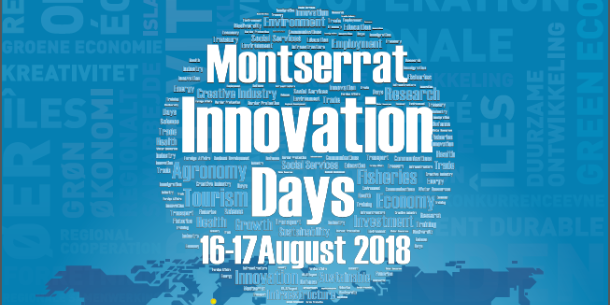 OCTA Innovation Newsletter – Montserrat Innovation Days reveals: The Government of Montserrat is organising Innovation Days in Montserrat on 16th and 17th of August 2018. Innovation Days will be held under patronage of the honourable Donaldson Romeo, Premier of Montserrat, who will personally open the Montserrat Innovation Days. That will be great occasion for local both public and private stakeholders to gather and to exchange relevant knowledge and best available practice in different aspects of sustainable development of the island. Mrs. Janice Panton MBE, UK and EU Representative for the Government of Montserrat and Chair of the OCTA Innovation will present Association of EU Overseas Countries and Territories (OCTA) and OCTA Innovation, EU funded project for propelling innovation in the OCTs. As an introductory speaker at the Montserrat Innovation Days, Janice Panton will particularly highlight her call upon the heads of the governments of the EU Overseas Countries and Territories to embrace Systemic Innovation for the sustainable development of their territories. The Premier’s Office on Tuesday this week, provided some more details. The linkages between innovation and sustainable development will be the focus of discussions on Montserrat for the ‘2018 Innovation Days’, being organised by the Government of Montserrat with support from the local Innovation Advisory Board. The ‘Innovation Days’ are scheduled for Thursday August 16 and Friday August 17 at the Montserrat National Trust starting at 9:00a.m. on both days. The event will be launched on Thursday morning by Hon. Premiere Donaldson Romeo who will deliver opening remarks. Other speakers scheduled to deliver remarks at the opening ceremony include Government of Montserrat’s UK Representative and Chair of the Overseas Countries and Territories Association (OCTA) Innovation, Mrs. Janice Panton, and Brussels based OCTA Innovation Team Leader, Milan Jezic von Gesseneck. The Brussels based OCTA Innovation Team Leader and the local Innovation Advisory Board explained that the ‘Innovation Days’ are intended to assist in enhancing sustainable development through innovation solutions for economic diversification. The event targets both local public and private stakeholders, encouraging exchanges of relevant knowledge and best available practice in different aspects of sustainable development of the island. During the sessions, Milan Jezic von Gesseneck, will lead a group of EU experts who will provide some lectures and transfer of knowledge on the best EU practices to Montserrat. Milan in particular will share his knowledge and experience in innovation and sustainable development; Innovation, entrepreneurship and green business expert from Trinidad and Tobago, Alan Cooper, will share his knowledge and regional experience in policy support for innovation, entrepreneurship and green business development; while development and tourism expert James McGregor, will bring the best worldwide practice and experience in visitor economy. Some members of the local Innovation Advisory Board will also deliver presentations based on their areas of specialisation. In addition to the Innovation Days on August 16 and 17, a round-table discussion on the ‘Creative Industry’ is also being planned for Monday, August 20 starting at 9:00a.m. at the Cabinet Secretariat’s Conference Room. The OCTA Innovation programme assists Overseas Countries and Territories (OCTs) in propelling innovation and creativity through the organisation of local ‘Innovation Days’. Innovation Days are events held in the OCTs, ranging from one day up to several days, with support from the Brussels based OCTA Innovation Team Leader, and features lectures and trainings from experts. Creativity in Monserrat has been recognised: handmade craft items specific to Montserrat. Emerald Isle Ceramics won OCTA Innovation BIC Award 2017 in creativity field.